Taking a European vacation with kids is different from traveling with your friends or your romantic partner. For one thing, there are fewer leisurely afternoons in pubs and cafes, and more visits to bakeries and parks. But you still want to experience the culture and maybe learn some local history. And this means going to museums…at least a little. So here are 10 museums across Europe that will appeal to the adults in your family but also do a good job of engaging kids at the same time. The Tate Modern makes a real effort to engage families. Check your stroller for free, pick up a family map of the galleries and ask for a special suitcase full of objects that will help kids explore the Materials and Objects exhibit. After seeing some art kids can belly up to the digital drawing bar where their creations are projected onto a museum wall. On weekends and school holidays the museum has special activities for different age groups. At the Victoria & Albert Museum preschoolers can ask for an Agent Animal bag that will send them around the museum in search of sounds and textures. Meanwhile 5-to-12-year-olds can ask for a backpack objects related to the exhibits. Look for interactive digital and hands-on stations throughout the Museum as well as pop-up performances in the galleries and craft activities on weekends. “I love it! So many very interesting, hands-on experiences for kids; and adults love them too!” says Sandra Dee Hoffman, an educational family travel consultant. 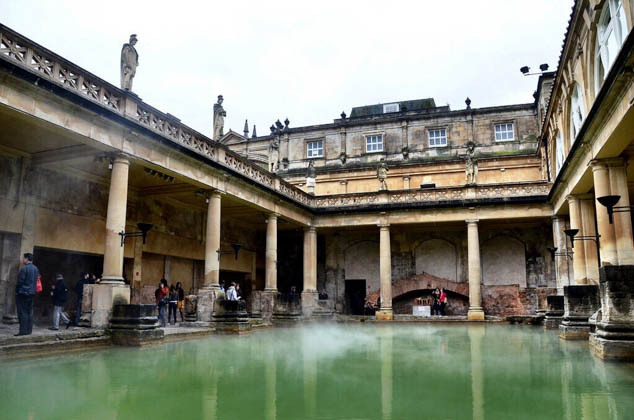 Travel Writer Mary Solio recommend The Museum at the Roman Baths for its “great” audio guides just for kids and two family trails, one each for kids over or under age 7. As you walk around the museum plan to encounter costumed Romans who will tell you about the exhibits and answer your questions about Roman life and history. The Pompidou Center is kid-friendly even before you walk in the door. A fountain outside is filled with colorful two-dimensional statues and the tilted courtyard leading to the entrance is excellent for scootering. Inside there is a creators’ studio just for for teens and another for kids, and a children’s space with two interactive installations that change annually. It’s modern art, so any given exhibit might amuse, befuddle or bore your kids. But the escalators follow a glass wall, giving you evolving views of Paris as you go from floor-to-floor and these alone keep kids exploring. Family travel writer Katy Clarke recommends the “fab,” ultra modern La Cité du Vin wine museum. Wine making is science after all. “The exhibits are all multimedia and very engaging.” She and her preschoolers especially liked a station where they had to identify hidden foods and other items by scent. What could be more appropriate in the city that gave us Mozart, Beethoven, Strauss, Brahms and many other composers than a visit to the Sound Museum (known as the House of Music). Its focus is classical music history but kids can use dice to create their own classical music, play on a piano staircase or conduct an on-screen orchestra. There are both tours and classical music concerts specifically for families. The Viking Ship Museum has family tours, workshops and outdoor activities during school breaks (most are over the summer). Kids and adults can also explore the boatyard where experts build Viking-era ships with the tools and techniques of the time. You can climb aboard and even go for a ride on these boats for a sense of how daring those Viking sailors were. Explore marine archeology with interactive exhibits inside the museum. Kids love learning about big historic events through the stories of everyday people. The In Flanders Fields Museum knows this and so provides every visitor with a digital poppy bracelet that allows them to follow the stories of four people through the exhibition (they don’t all survive). Soundscapes, videos, poems and diaries vividly bring the war and its impact on people to life for visitors. Canadian travel writer Claudia Laroye calls the museum “Absolutely superlative,” but also cautions that some aspects of it can too much for kids who are sensitive to loud noise or who are old enough to understand but not process such devastation. The Vasa Museum’s main feature is its namesake warship, which sunk minutes after it was launched in the 1600s and was recovered in the 1950s in surprisingly good condition. The museum displays the preserved and restored ship, a full-color scaled replica, every day items belonging to the ships crew and more. In the Sail-the-Ship Adventure, two to four kids work together to get their virtual ship underway. The Deutsches Museum is the first science and technology museum I’ve visited that felt like it was built for grown-ups, but this doesn’t mean kids will be bored. Unless you have endless time, choose two sections of this enormous museum to explore in depth (materials and energy, transport, or communication, for example). An Inventor’s Trail app lets kids follow different trails (mobility, energy, drivechains, or communication) through the exhibits. After you’ve explored a bit, kids 8 and younger should head to the hands-on i Kids Kingdom. Tweens will want time for the TUMlab where they can they explore coding, robotics, automation, design and chemistry. Teens can explore molecular biology in the DNA lab. Which one do you want to visit? Which would your kids like? Tell us below.